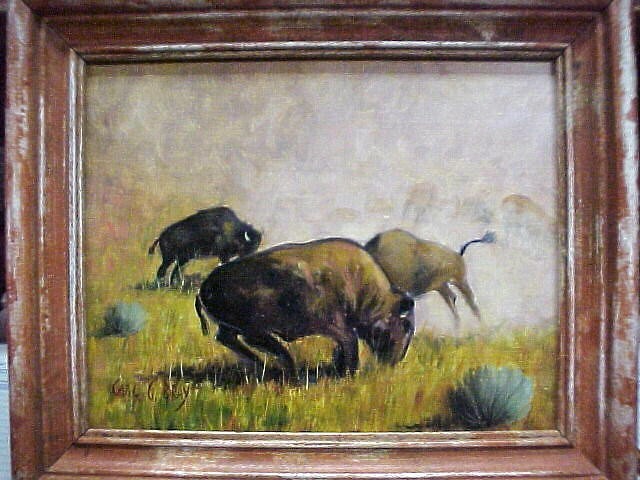 Original Oil "Buffalo Play" by Carl G. Bray 8"x9"
This is a wonderful original oil painting on board painted approx. 1940s by listed artist Carl G. Bray. It depicts Buffalo Playing. Approx. 8.75 x 9.25. This is a wonderful original oil painting on board painted approx. 1940s by listed artist Carl G. Bray. It depicts Buffalo Playing. Approx. 8.75 x 9.25. Please email cowboycabin@centurytel.net with questions or call 406 270-2842.